Today was Halloween ComicFest at comic book shops all over the country. It is sort of a mini Free Comic Book Day with a Halloween theme. Our local shop, wild Time Comics pulled out all the stops and got all decorated for the event. I didn’t actually get to see it all in person but I’ll get to that. I wrote about the event over at the Cooper and Kid site, Catch, as part of my Play column. I was very excited to bring Eva to get comics that I didn’t even stop to think how people would be dressed up to get the comics. That was a detail I should have thought about. When I think of Halloween I think of kids out Trick or Treating wearing their cute little costumes. I don’t think about ghosts and ghouls and goblins and scary psycho clowns and all that stuff. I should have through about that because that is what we saw. Now, I do not at all begrudge the comic book store for the decorations. Halloween is about scary fun. The thing is, a six year old who is super sensitive is going to be very upset by scary images. We got to the store at just about 10. It wasn’t ready to open so we hung out waiting. There was a giant inflatable cat there so I took Eva’s photo with it. She was fine with something like that. Then a big Zombie statue was brought out and she asked us if we could move out of eyesight of it. So we moved. Eva’s friend from school arrived with her mom, who writes Strawberry shortcake comics. Eva was very excited. That is, until she saw the kid in the scary clown costume. It was a very scary mask. At first she was doing okay and then the move the clown moved around she got more and more scared. She wanted me to pick her up, which I did. Then she completely clenched up her mouth and was screaming at me to take her home. Nothing that we could say would convince her to stay. She was very scared. I should have thought that there would be scary costumes at the event because many comics are for adults. Adults wear scary costumes for Halloween. Older Kids wear scary costumes for Halloween. I didn’t think of that. I thought it would be more like Free Comic Book Day with people in superhero costumes. So, next year I go alone. Eva’s friend’s mom was very sweet. She asked the comic book store for some extra copies of the comic books to bring to Eva. When I woke up to go to work she showed me her new comics and even the goody bag that she got from the owner of the comic book store. 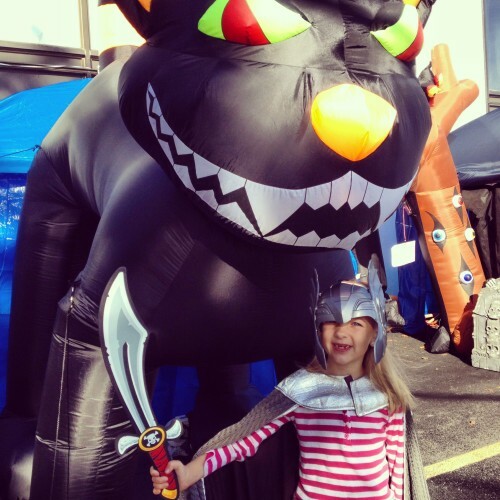 Then she went to trunk or treat. Allison got to run interference on the ghosts and ghouls at that event. This is a tough time of year…even for me and I’m 38! Every year Busch Gardens and Universal out on these Halloween events…that I would NEVER go to…but I can’t escape the advertising. The billboards and commercials are HORRIBLE!! There is no need…it’s bad enough that people are sick enough to come up with that crap…children shouldn’t be exposed to it at all but they can’t avoid it. 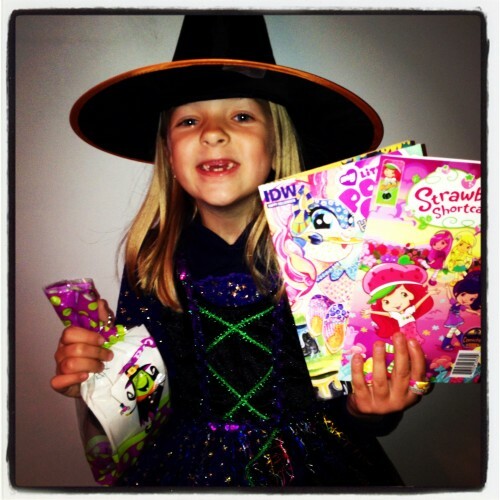 I hope Eva has a great Halloween…with all the fun that’s due to her. And you and Allison too!!! I agree with you. I don’t like those billboards either. They are horrible. Eva is still a bit skittish about masks and costumes for Halloween but she’ll have me with her when she does her trick or treating.